We have entered our second week of summer vacation! 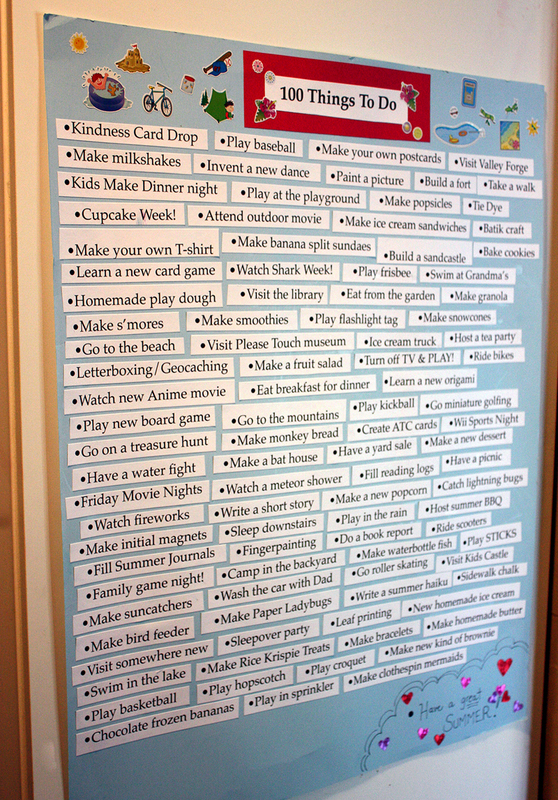 Our 100 Things to Do poster is up and we are already beginning to mark our progress with stickers. We have kept some old favorites from our previous lists and added a couple new ones. The girls look forward every summer to creating this poster so it has now become one of our family traditions! Watch Shark Week! Starts Sunday, July 31st. Maybe we will have a repeat Jaws viewing on our Friday Movie Night this week as well. Make monkey bread. We usually make the cinnamon-sugar recipe but there are some other great recipe variations here. There are some things on our list that will be repeated many times over such as "Ride bikes", "Visit the library", "Eat from our garden", or "Build a fort". 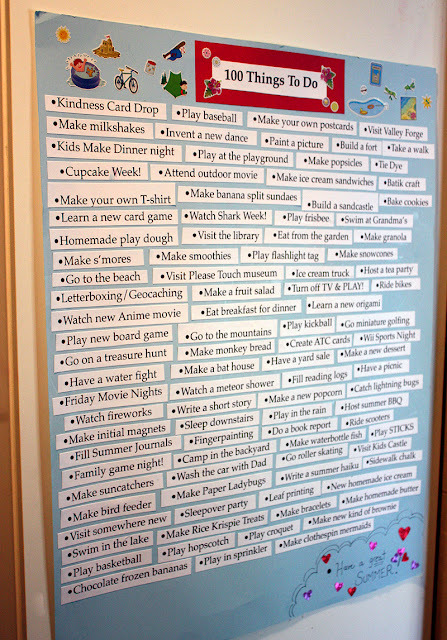 This poster is a great go-to list for the kids to find inspiration in their summertime. It also gives them a perfect excuse to argue over who gets to mark the next sticker on the list! What is on my personal summer manifesto? I want to keep the TV off and keep the girls' creativity on by spending time outdoors, playing, drawing, creating, and reading! Complete ALL 100 Things to Do on our list this summer!!! on your "summer list" this year? I wish I was going to have such a fun summer! Enjoy! This is an awesome idea. My girls aren't in school yet so mainly we are all the time trying to think of things to do hehe, but I will make a mental note to do this for them. It's a wonderful idea to combat the summer "I'm bored"'s....I wish my mom had come up with something like this for my younger sister cause she would drive us all crazy with her complaining ^_^. What a great tradition! I love your list! Fantastic ideas! Your girls are gorgeous, by the way!